You can barely take a step in the modern world without everyone knowing where you are and what you're up to. Take your choice: You can Facebook, tweet or simply change your BBM or Whatsapp status to instantaneously geotrack yourself. This morning, I got to use that connectivity for good cause. I was privileged to visit the "Ohel" of the Lubavitcher Rebbe. Some casually call it the Rebbe's resting place. Kabbalah describes a Tzadik's grave as holy ground and a portal of connection to on High. Either way, it's an inspiring place and a well of blessing and miracles. Arriving at the Ohel, I updated all the relevant social networks and set about preparing to daven. I expected to get a number of requests for prayers. Nothing could have prepared me for the cascade of messages that clogged my phone over the next hours. No Facebook update I've ever posted garnered a fraction of the responses this one did. Just about everybody on my BBM list replied. Sadly, a large portion of the list was for people who need healing. A good portion was for people seeking their soulmate or hoping to fall pregnant. Many simply asked for a general brocha. I learned that every person needs some blessing in their lives. I saw that we need to appreciate those times when the blessings we need are not for the serious problems that others are facing. I also got to experience the overwhelming unity and goodwill that comes from sharing an opportunity for blessing with others. Most inspiring of all, I learned that the Jewish soul instinctively knows that we have an address for blessings. Dozens of people sent me hundreds of names within moments of me inviting them to share my visit to the Ohel. Almost none of these people have ever visited the Ohel personally or met the Rebbe. 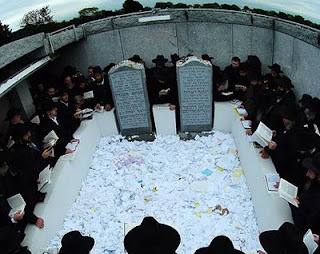 Most of them have never studied the philosophy behind praying at a Tzadik's grave and how or why it works. They just have built-in faith. I stood at the Ohel feeling blessed for being there; for having an address to turn to for a blessing; for belonging to a People who naturally share that connection. May all those blessing requests be fulfilled.